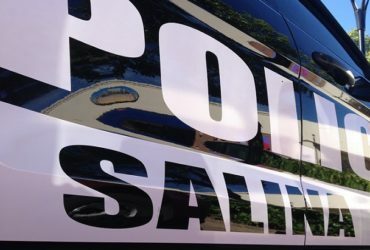 A large police presence was at the scene in the Indian Village area of West Salina Sunday morning after a body was found. Salina Deputy Police Chief Sean Morton told KSAL News at the scene that dispatch received a call alerting that there was a person who was possibly deceased, in a car. The call came in at 10:11 Sunday morning. Officers responded to the 700 Block of Seneca Avenue. They discovered a body in the back seat of a car, parked in a driveway. Morton says that an investigation into how, and why, the person in the car was killed was in the very early stages late Sunday morning. Multiple officers were working the scene, which is located at the intersection of Seneca Avenue and Cherokee Drive. Crime scene tape surrounded the area, and barricades were in place. The car was parked in a drive way of a home in the Indian Village area.